Dates: Wednesdays: February 20, 27; March 13, 20; April 3, 10, 17, 24; May 1, 8, 15, 22. Enrollment: Class size is limited to 9 students. Prerequisites: Be able to read Tibetan (U-Chän). Be at least 18 years of age. You will learn the basic grammatical elements and structure of literary Tibetan grammar. You will also learn a variety of basic Dharma terms. By the end of this overview, you will be able to understand how Tibetan is translated. 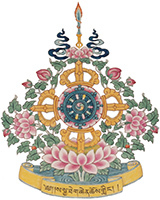 We will translate a commonly recited “Refuge & Bodhicitta” prayer and several other important verses and sentences over the course of 12 classes. Eric Dulberg’s “Overview of Tibetan Grammar” and supplementary materials will be provided. How to Read Classical Tibetan, Vol. 1. Eric Dulberg has been a Buddhist since 1975. When he moved to Seattle in the 1990s, he became a member of Sakya Monastery. He began to teach literary Tibetan in 2008. During the past 20 years, he has studied Tibetan with both Tibetan and Western teachers of the Tibetan language. Eric’s professional background includes a BS in physics and an MPH and DrPH in epidemiology.